You are looking at a beautiful set of TRADITIONALLY-CRAFTED Talismans, lovingly created to provide you with a direct link to the powerful dark energies of the Luciferian Tradition. These STUNNING piece are as close to an EXACT REPLICA of those Talismans used by Occult Practitioners of times gone by, right down to the authentic patina that has been applied. 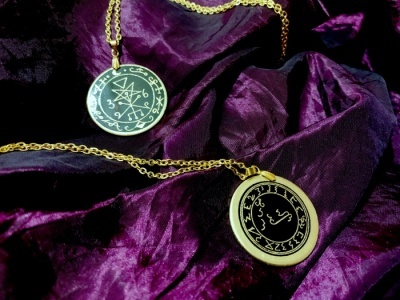 These unique Talismans are constructed from SOLID, 1.2 mm THICK BRASS, with the Magickal Seal deeply inscribed into the metal itself. They have been designed to last a lifetime - and beyond. Your one-of-a-kind Talisman set is TOTALLY UNIQUE; no two will ever be the same! 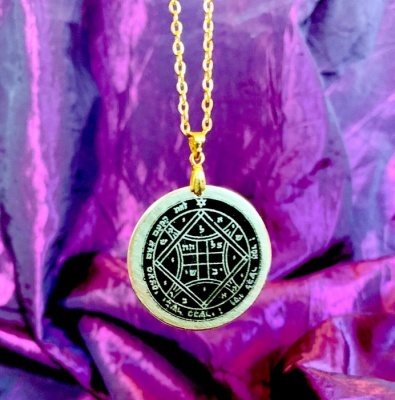 Your Talisman set is supplied with a Gold-plated 18-inch Chain, and backed in deep burgundy velveteen, completely in line with Tradition.